All we really need is a Y-pipe to go from the headers to a FD cat back. That would work for most swappers. I know I prefer to use the RB dual exhaust on my builds. This is exactly what I need. Is there any chance of this happening? It seems pretty simple, to go from the headers to an RX7 aftermarket cat back. I was going to order supplies to fabricate my own, but if there was any chance of it i would hold off. If I had someone local to us in Irwindale come by with a factory exhaust, I'd be interested in taking a look. We could make something like that pretty easily (and cheaply). just to bring this back up, i ended up making mine out of mandrel bends, a flange, a y-pipe, and a couple short flex pipes. sorry about that performance. didnt see your post. do you have a set of our headers installed ? whoa, didn't know you replied. Jordan Innovations : I think there's a market for max-effort (or at least higher-effort) headers for the FD community. Stamped collectors are fine and all for most people, but there are so many people running around with VERY similar setups that making a truly IDEAL set of Tri-Y's would be a worthwhile move IMO. I'll play with the numbers, but at 1 3/4" I think the exits may be compatible with JTR's. I think a Tri-Y would suit my goals. I would sacrifice some top end power to have a broad flat torque curve that would be predictable coming out of fast corners. I've attached a pic of the Doug Thorley Tri-Y headers for a 2010 Camaro. Also attached some Yates Nascar Tri Y headers. First thing I notice is the stamped 2-1 collector off the primaries, a cost saving thing I guess. The thing that really gets me is the length. The primaries on the Nascar are much longer before the merge to two pipes and the two secondaries have a long run to the collector. Is this how a Tri-Y is tuned to a RPM range ? Looking at the BBK 1594, the cylinder pairings are similar to the Thorleys. It makes me wonder if the 1594 could be converted to Tri-Y ? These Flowmaster Tri-Y collectors look interesting too. Just putting 4-2-1 on each bank isn't going to net you additional power ~ the reason why 4-1 is so prolific is that most of the time, it makes more power up top (which sells headers) and doesn't lose anything in the middle. I played around with Tri-Y on my cam'd LS6 setup in software vs. the 1 7/8" JTR headers (approx 32" primary length, decent collector but not ideal) and couldn't come up with a Tri-Y that made more power in the middle and made more up top. If you have a setup that needs a tuned header (like you're trying to lift a certain area of the torque band) you can play with it, but all three things you posted are radically different from each other. Thanks for your insights. I just find headers fascinating right now and remember how popular Tri-Y was 30 years ago. I've never heard a set and had no idea they sound different. I had no idea there was a program to model exhaust. I guess that program would say the Flowmaster is just a long collector that looks like tri-y. I was thinking because it's aluminized steel it could be cut up to make a custom Tri-Y cheaply, despite it's D-Tube technology . The 4-1 merge collector project dc2 uses, is there a close up pic of it somewhere ? This makes the most vacuum at the collector, right ? Does a ORY and cat back harm the effect ? An optional Y-pipe with the headers would be sick!! Doing my swap soon, and looking at options. I can see how the R&D of developing a full exhaust may not be worth it. However, with adding an optional "Y-pip" it does 4 things. 1. Reduces fabrication times and R&D involved. 2. Allows the buyer to use any standard cat-back he may want or already have. 3. Allows the buyer to have a true bolt on system. 4. Draws the buyer to your product because of ease of installation. one of the hardest parts is that there is a slight variation due to welding . 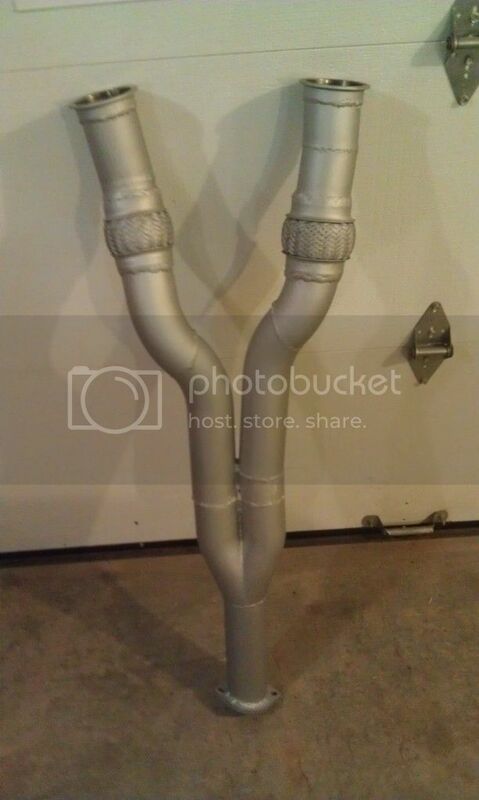 also shipping would be killer due to the length of the mid pipe exhaust. No to mention headers are barely moving off the shelf.